One of Composr's core features is the forum. While forum usage might be on the wane in some areas due to the prevalence of Social Media, forums are and continue to be a key feature within Composr, and a large part of many online communities. 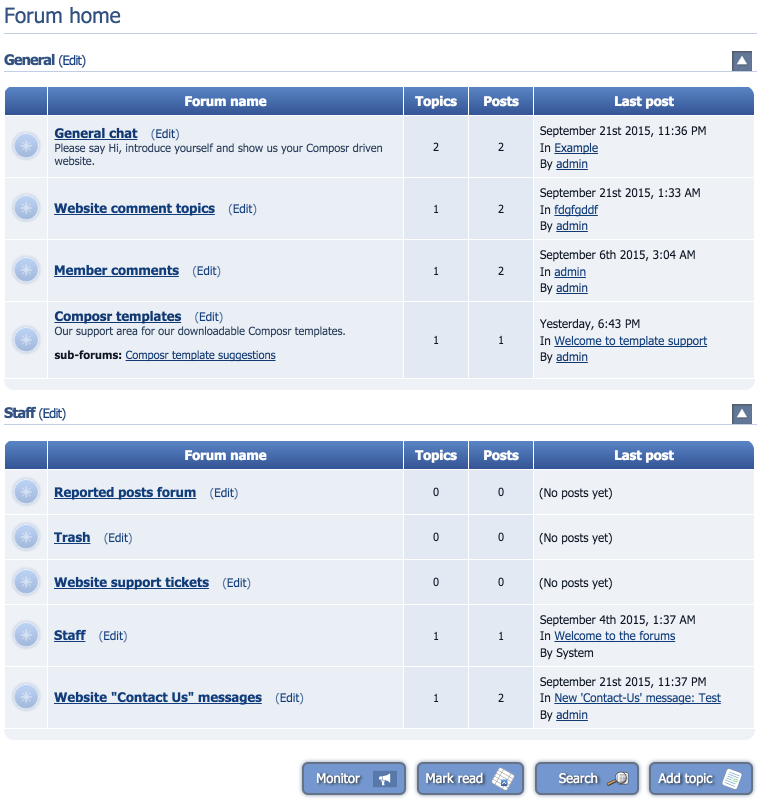 Composr forums include many of the common forum features found within other well-known forum systems such as phpBB, SMF and vBulletin. Like most forums, Composr forums utilise a tree structure. A huge benefit of Composr's forum is the complete integrated nature of the forum and the main website software. Unlike many other forums or CMS which can either have a content management system- like software tacked on, or a forum module added to the main CMS, you can be sure that both CMS and Forum seamlessly flows from one to the other on a Composr website. Composr forums have a comprehensive set of options. This is a 'how to' tutorial for some of the most common forum administration tasks. The basic forum has two forum groupings set up as standard, which are General and Staff. "General" includes a general discussion section and a forum which houses all of the comment topics from content elsewhere on the site. The "Staff" section is a private section of the forums for staff to use and also is where things like reported posts and support tickets appear. 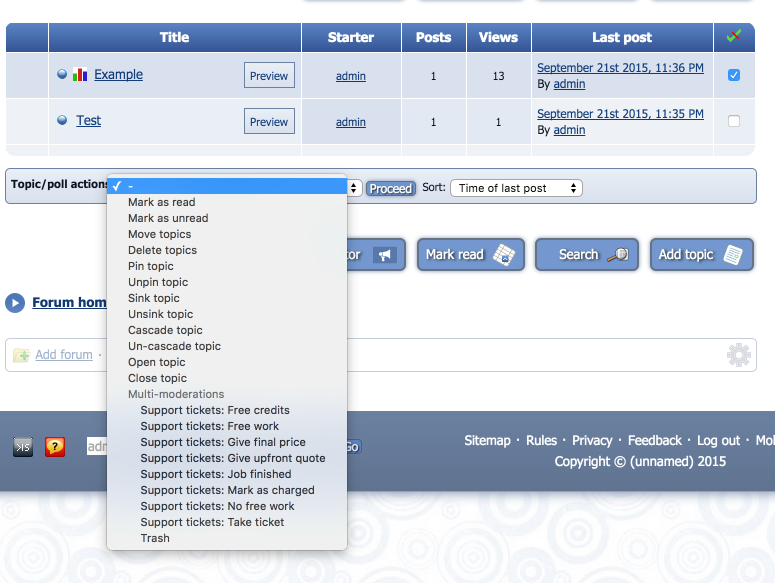 To add a new forum, navigate your way to the forum admin screen which can be found at Admin Zone > Structure > Forums. From here click "Add forum grouping" and fill in the online form which includes the name of the grouping and a description. You can also choose whether the grouping is expanded by default. Once you have added the grouping, the software will take you to a follow-up admin screen comprising of many of the most common tasks such as adding a new forum to your new grouping. You can add a new forum from Admin Zone > Structure > Forums > Add forum. The Add new forum form is split into three sections. There is a general section which you need to complete, an advanced section and a permissions section. The General section includes options such as the Name of the forum and a description. You also need to choose in which grouping the forum will appear, and if the forum is a sub-forum of another forum you have already created. If the forum is not a sub-forum choose the "Forum home" as the parent. The Permissions section allows you to give various usergroups different permissions within this forum such as making member of a usergroup a moderator of this forum. By default this will use the standard forum permissions set. Once this is complete you can click on the "Add forum" button. To reorder your forums, go to Admin Zone > Structure > Forums > Edit forum. From here you can access the edit screen for each forum and also reorder your forum groups and individual forums. To reorder the grouping so a new grouping appears at the top, you can change the numbers which appear on the blue bar next to each forum grouping name. To reorder the forums within a grouping, simply change the numbers in the drop-downs as required next to each forum that you want to reorder. Once you have the forums ordered as you like click "Reorder forums". To activate any of these options simply select the checkbox to the right hand side of each thread, choose the moderation option you want and click Proceed. In some cases you will be taken to another screen which allows you to add a reason why an action is being done so other staff are aware.